How to fight dandruff problems? A condition that causes flaking of the scalp and is usually accompanied by itching, Dandruff is one of the most common hair problems faced worldwide. Although unpleasant and difficult to deal with, dandruff is a condition caused by a fungus and is not contagious. White flakes on the head and scalp along with dryness and itching are the signs and symptoms of dandruff, making diagnosis of dandruff easy. What is the best treatment and cure for dandruff? 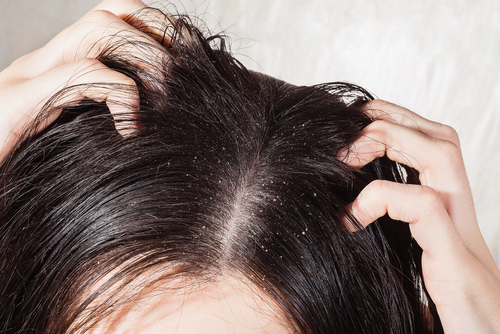 Although it is a chronic issue, dandruff can be treated at home to reduce the flaking. Begin by washing your hair daily with a mild shampoo. Massage the scalp well and then rinse properly. This is the best way to remove dandruff as it gets rid of the dead skin cell flakes and reduces oiliness of the scalp preventing the white flakes from building up. If this isn’t helping, another dandruff cure is switching to anti-dandruff shampoos that are made specifically to target the dandruff problem and contains the required ingredients. After two weeks if these methods are not helpful, it is best to see a dermatologist and get medical treatment for dandruff. At Welona, we have the best dermatologists and best dandruff specialists in Chennai that perform a thorough examination to understand the root cause of your dandruff problems. After diagnosis, our dandruff specialists will provide you with the best solution for your extreme dandruff problems may prescribe a medicated shampoo or some steroid lotion for the scalp. For effective dandruff treatment, it is important to use products that contain active ingredients that have antidandruff, antiseptic and antifungal properties which help in clearing the flakes and curing dandruff. Apart from medication, they will also give you useful dandruff control tips and effective ways to help control itchy scalp as well. Visit us at Welona for the best antidandruff treatment in Chennai. How to clear and avoid dandruff naturally? Dandruff can be controlled and cured at home with regular washing and brushing of hair. Avoid using any hair products as they cause significant damage and have an impact on hair health and increases chances of itchy scalp and dandruff. A healthy diet helps keep dandruff away, prevents premature grey hair, and promotes healthy hair growth. Why get dandruff treatment from a specialist? Leaving dandruff untreated, results in acute itching of the scalp, increased flaking, and hair fall problems. The white flakes on your head and shoulders will also leave you embarassed and worries.You can try home remedies for dandruff like the application of fenugreek paste or yogurt on the hair and scalp as they work like natural anti-dandruff treatments. Visit us at Welona to consult with the best dermatologist in Chennai and get effective antidandruff treatment.